America lost one of its shining lights this week. Sargent Shriver, an unfaltering beacon for peace and an indefatigable bastion against poverty, was a tireless bearer of burdens of those less fortunate. 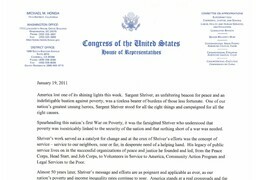 One of our nation's greatest unsung heroes, Sargent Shriver stood fo d campaigned for all the right causes. Spearheading this nation's first War on Poverty, it was the farsighted Shriver who understood that poverty was inextricably linked to the security of the nation and that nothing short of a war was needed. Shriver's work served as a catalyst for change and at the crux of Shriver's efforts was the concept of service -- service to our neighbors, near or far, in desperate need of a helping hand. His legacy of public service lives on in the successful organizations of peace and justice he founded and led, from the Peace Corps, Head Start, and Job Corps, to Volunteers in Service to America, Community Action Program and Legal Services to the Poor. Almost 50 years later, Shriver's message and efforts are as poignant and applicable as ever, as our nation's poverty and income inequality rates continue to soar. America stands at a real crossroads and the loss of one of our great American leaders reminds us of our nation's needs for a mo again take the helm in Round Two of this war on poverty, eliminating once and for all this festering wound. Filling Shriver's shoes will be difficult. President Clinton was right: "Never has America had a stronger warrior for peace and against poverty than Sargent Shriver". 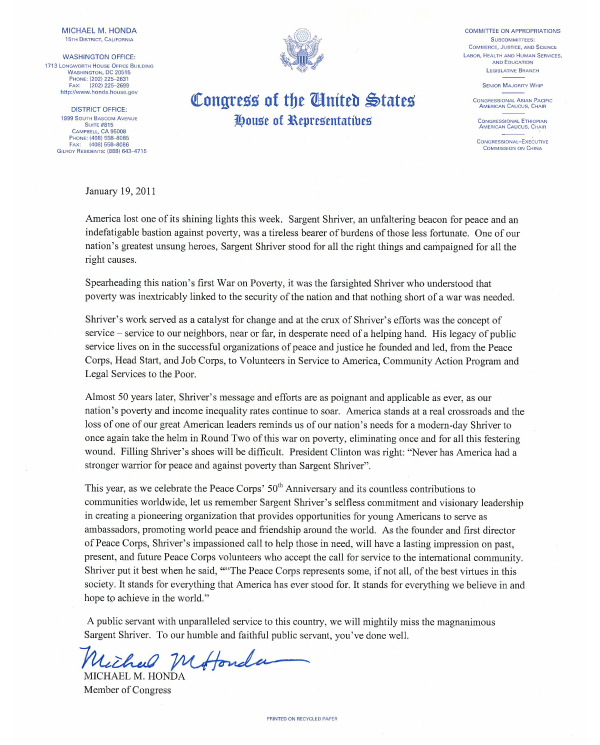 This year, as we celebrate the Peace Corps' 50th Anniversary and its countless contributions to communities worldwide, let us remember Sargent Shriver's selfless commitment and visionary leadership in creating a pioneering organization that provides opportunities for young Americans to serve as ambassadors, promoting world peace and friendship around the world. As the founder and first director of Peace Corps, Shriver's impassioned call to help those in need, will have a lasting impression on past, present, and future Peace Corps volunteers who accept the call for service to the international community. Shriver put it best when he said, "The Peace Corps represents some, if not all, of the best virt ues in t r everything that America has ever stood for. It stands for everything we believe in and hope to achieve in the world." A public servant with unparalleled service to this country, we will mightily miss the magnanimous Sargent Shriver. To our humble and faithful public servant, you've done well.